First of all let’s get some things straight: traditional Irish Soda Bread does not contain any fruit, eggs or fats such as butter or margarine. If these are included in any recipe you find, it may be nice bread, it may even be Spotted Dog, but it isn’t Irish Soda Bread! There are just four simple ingredients required, flour, bread soda, buttermilk and salt but you need the right simple ingredients to get the best results. Often when people try to make this bread away from home it tastes all wrong, nothing like the delicious stuff they ate while in Ireland. That is because Irish flour is different, it’s made from wheat grown in a particular soil and climate, and is soft and low in gluten. Ideally you would be able to track down Irish flour (which you can, here, but at a stiff price! ), otherwise the best choice is unbleached or plain white flour. If you cannot get that, use all-purpose flour but do not use hard or bread flour. These flours are very high in gluten and simply will not work in breads that do not use yeast. You also need to be fussy about the buttermilk you use – homogenised will not work well. Ordinary milk will not do – it is the high acid content in buttermilk reacting with the alkaline bread soda that causes soda bread to rise. A good alternative is whole milk (not low fat) which has been allowed to go a little sour, in fact many Irish people use up old milk by making bread. In an emergency I have added a half teaspoon (¼ American teaspoon) of vinegar to fresh milk to make it acid – it does work, but is not perfect and tends to produce a heavier bread. The reaction between the buttermilk and the bread soda starts the instant the ingredients meet. That’s why it is vital to get the bread into the oven without delay – you want this magic reaction happening while the bread cooks. Wait too long and the reaction is all over before heat is applied and your bread will not rise. So it’s very important to have everything ready before you begin and then get on with it as quickly as you can. Sieve the flour, bread soda and salt into a large bowl and mix. Make a well in the centre of the flour and pour in about 2/3rds of the milk. Quickly and with a light touch bring the flour in from the edges and mix with the milk, until all the ingredients come together into a dough. Use your hands for this, never a spoon or mixer. It is impossible to be exact about the amount of buttermilk needed, it will depend on the nature of the flour. Be guided by the look and feel of the dough, which should not be sticky but should come together easily into one piece of soft, slightly floppy dough. If it is too dry and crumbly add a little more buttermilk; if it becomes sticky, add some more flour. Once the dough has come together, do not knead, simply place it on a floured wooden board, pick up a handful of flour and rub it into the palms of your hands so that they are perfectly dry, and and shape into a flat round about 2 inches thick. Place on the baking tray, then cut a large x on the top. This is to let the fairies out so that they won’t spoil the bread. Really. Well ok then, not really, but it results in more even cooking. Do all of this as quickly as you can, from start to finish should take less than 5 minutes. Then put the bread into the oven immediately. Wait for about 5 minutes, then turn the oven down to 400ºF (200ºC/regulo 6). The initial high temperature ensures a good crust. After another 20 minutes take the bread out and knock on the base. If it sounds hollow it is done, if not pop it back in for about 5-10 minutes and then check again. The bread should be eaten the day it is made. This will not be a problem! I live in Northern Ireland and I can 100% assure you that we often add dried sultanas and raisins to oven soda bread. My mother did it, my grandmother did it. It is available here in all home bakeries. It is a perfectly acceptable soda bread and we certainly (those of us who ACTUALLY live here) would call it soda bread. Adding dried fruit to oven soda is NOT an American invention, it is a treat. It amazes me when people tell us ‘this is the only proper and authentic recipe’; there will always have been variations! There are two traditional soda breads in Ireland. White soda bread and wholemeal soda bread. White soda bread with rasins or sultanas in it is also known as Currant Bread or Curny Cake and would traditionally be baked as a treat. And what a treat fresh out of the oven with plenty of butter melting on it. Must dash- have to do a bit of baking. As a Dublin woman who has had soda bread all her life, we do put butter in our soda bread, and we also have a fruit version too, so if you are going to put instructions up about our food then put the correct one in. My granny worked in bakeries and made soda bread and scones for 10 children, and 50 grandchildren using the traditional methods with butter and sour milk.. to taint fresh milk she would put some tartar powder not vinegar or lemon juice. I’ve heard that those who have sensitivities to wheat flour grown on American soil might be able to eat wheat grown in other places in the world. I would like to try this to see if it works for me. I tried to click on the link you provided on your web page but it doesn’t work. Could you perhaps provide the name and any contact information of the place one can find the flour grown in Irish soil? Thanks from and Irish American who wants to eat Irish Soda Bread again! Hi There my children love soda bread my mum thought me to make it as her mother thought her,its simple and economic in times when money can be tight!We can buy fresh buttermilk here and I always keep a supply! I do cheat a bit and add a whole egg as I have hens so plenty of eggs makes the bread nice and soft and an added bonus to us because my daughter is a finicky eater so she gets a bit extra nutrition from the bread!! Here in the States most of the what is called “Irish Soda bread” had raisins in it. My sister and I visited Ireland last October, and none of the soda breads or scones for that matter had raisins or fruit. Is this just a crazy American twist? I have used some of the recipes listed here. I really like the Tea Brack and the Brown Soda bread. By the way I love all the information provided here. We had a wonderful time and I would return to Ireland in a heartbeat. Yes, fruit in soda bread is a a US variation. If sugar is also added (as it is on a number of the recipes I’ve seen on US sites) it’s not really soda bread at all anymore! Soda bread is a very, very simple recipe with very,very simple ingredients, because that’s all the people would have had. Real soda bread has only 4 ingredients – if there are any additions it’s maybe a lovely bread, but it’s not really Irish Soda Bread. Hi, I have just read your recipe for Soda Bread and just wanted to let you know that the cooking time is incorrect. Bake at 190 c for 20 minutes and reduce heat to 170 c for a further 20 minutes, this allows the flour to cook properly. Check 5 mins before taking from ovenand return to oven if bottom of bread does not have a hollow sound when tapped. I live in the midlands of Ireland and learned this recipe at a very young age from my grandmother. My children now use it today. Thanks Patricia – The timings I use work ok for me, I use them all the time and the bread is definitely cooked! If anyone is having trouble with them, then maybe they could try yours. It’s not a very exact thing in a way – ovens vary such a lot. Great sight Katherine ! im doing a project on Ireland and I need to bring in some Irish food and you saved me im going to bring in Irish soda bread ! Katherine are you Irish or do you now all this stuff? A suggestion for American kitchens: try using three parts unbleached flour and one part what is called “cake flour” here (a commonly found brand in my area is Swans Down), which has lower gluten content and is made from softer wheat. I use this combination for American-style biscuits and for pie crusts and it works very well. Treacle soda bread is also very traditional in the north of Ireland. Add 2 tablespoons of black treacle to the buttermilk and heat until melted and well mixed, then leave to cool before using. Lovely toasted with lots of butter. All recipe ingredients given are great though I find on internet today that in Ireland we can get “sodabread flour” and all we have to do is add the buttermilk, knead and bake. Also not mentioned is the fact that sodabread can be done, best in my opinion, on top of a griddle which has been placed on the overhanging hook above a fire and slowly baked.wonderful; I still smell the aroma wafting through the house. I understand that may not be suitable nowadays but griddles are available for stove tops (flavour of the baked bread will not be the same but acceptable) Note that oven soda and griddle top soda are different slightly in that there is no crust. Now I know what is wrong with my soda bread. I am using bread flour. The flour you are describing is sometimes called unbleached pastery flour here in the United States. Pastery flour has less gluten My husband is 3/4 Irish and 1/4 native American. He was surprised to find that Irish cooking is very much like the Cherokee Indian cooking he grew up with. Buttermilk is what is left when whole milk has been churned to make butter. It’s quite acid, with a high lactic acid content which is a result of lactose (or milk sugar) which ferments as the butter is made. This is important, as it’s the acid in the buttermilk reacting with the bicarbonate of soda (ie bread soda) which causes soda bread to rise and have a nice light texture. If you make it with ordinary milk instead of buttermilk it is heavy and not very nice. There are two alternatives if you can’t get buttermilk. One is to use slightly sour whole milk, which also contains a lot of lactic acid. 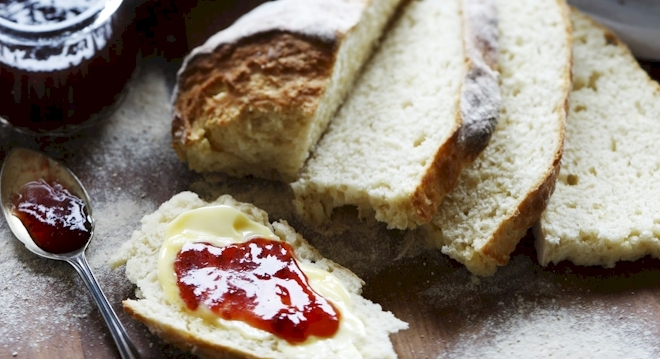 It works well, and making bread is a common method of using up soured milk in Irish kitchens. The other is to add a little vinegar, which acts as the acid. This works, but it’s not as good. You may find that allowing whole milk to sour doesn’t work very well, unless it’s raw (unpasterurised) milk. Most ‘shop’ milk is pasteurised, which means many of the bacteria have been killed off, and the ones that are left don’t tend to make the milk properly sour, but rather rancid (the former tastes acid but still quite pleasant,whereas the latter tastes really horrid). If you want to sour fresh milk, lemon juice tends to work better than vinegar. This is the way my Irish grandmother taught me to make traditional solda bread when she came to visit us from Ireland. I was 10 years old. This is the first recipie that hasn’t called for sugar, raisins or butter/shotening. this is the “real deal”. She taught me how to make it on top of the stove in a heavy aluminum deep frypan. It came out looking like a wheel. Granny made 3 or 4 of these every night after putting her twelve children to bed. I now make it for my children and have done so ever since my Granny taught me how to do it 42 years ago. It is so light and moist and makes a great bread for sandwiches for thhe kids lunches for school. I think that I just might take the buttermilk out of the frdge to make some later. The bread is even better when thhe buttermilk has had a chance to come to room temperature before making the bread.